Although we feel that a beautifully designed staircase looks amazing on its own, we understand that a little customization can go a long way. Stairs are the first thing people see when they walk into a home. In order to make the best first impression, depending on the occasion, it’s a good idea to do some decorating, so here are a couple of ideas you can use. Enhance any entryway with these easy tips. Chalkboard paint. One of the easy and most versatile ways to customize a staircase is with a little chalkboard paint. Paint cardboard panels and tape them to the stair risers for a look that’s fun yet easily changed. Once the paint is dry, you can even let children write on the stairs—a mom-approved alternative to drawing on the walls! If you want a unique look without paint, invest in some wallpaper to cover your stairs. With a vast array of wallpaper designs at your disposal, there’s no limit to how many looks you can create. Only want a temporary look? Cut out scraps of wallpaper or wrapping paper and tape them to the stairs. Faux bricks. You can enjoy the look of bricks without sacrificing your wooden staircase by painting paper to look like bricks and attaching it to your risers. Use different colors to create a visually striking twist! Many retailers offer decals or paper cutouts you can use to create silhouettes on stairs. Check out these cute mice! Quotes and song lyrics. Use decals or stencils and scraps of paper to incorporate your favorite words from songs, books or movies into your décor. 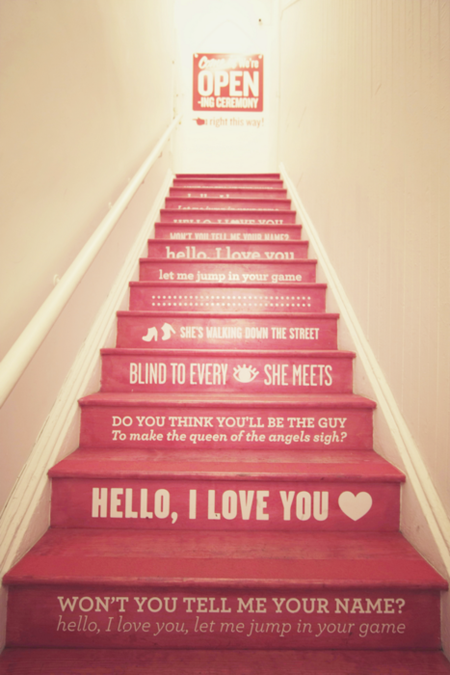 If you love The Doors, you should definitely take a look at this staircase, featuring some of their lyrics. The decals and stickers are easy to remove, just in case you change your mind! Ombré. This hot trend is popping up all over the place—from hair and makeup to walls and stairs! Get in on the fun by painting stairs in graduations of a single hue. Again, paint on different sheets of paper and attach to your stairs for temporary elegance. No matter how you decide to decorate a staircase, our team at StairSupplies would be happy to discuss décor ideas with you. For more information about our top-quality stair parts and accessories, you can get in touch using this form or through any of our social channels. We look forward to hearing from you!